MINIZ Series LED Down lights are a range of 220~240Vac, 7W and 9W LED Downlights, designed with an internal dimmable driver compatible with leading edge & trailing edge dimmers. MINIZ incorporate a high efficiency LED chip, innovative reflector system and low glare bright lumen output with a wide beam angle of 90˚ to enable fewer fittings are needed within an installation. 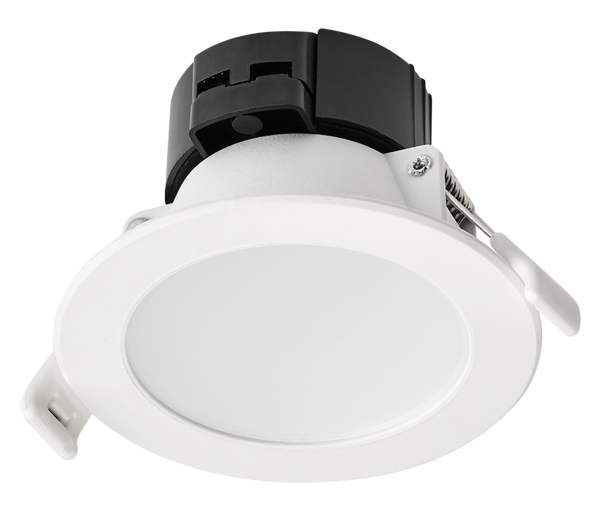 MINIZ Series LED Downlights are recessed 7W and 9W LED down lights produce a low glare 90° beam angle with light output colour options of 3000K and 4000K, at lumen outputs up to 750lm. These 3” and 4” fittings are ideal as a replacement to Halogen applications; with ease of installation, low maintenance requirements and reliable high efficiency LED chip you can expect a lifetime of over 50,000 hours.The IP44 rating assists with this long lifetime by providing extra protection to applications. Supplied with integrated dimmable driver for easy installation and suitability for use with most leading edge and trailing edge mains dimmers, the MINIZ series of LED Down lights are a cost effective lighting solutions and ideally suited to domestic, retail and commercial applications. The standard fitting colour is white, but the MINIZ4” model also has an optional clip on satin nickel trim available.